The energy sector is a key component and driver of economic development requiring a large amount of infrastructure, both to generate the electricity and to transmit it through electrical power lines. These important developments are sometimes planned for sensitive locations within important flyways. Wind energy is considered to be a clean energy source but it produces negative impacts regarding avian mortality in these energy facilities. 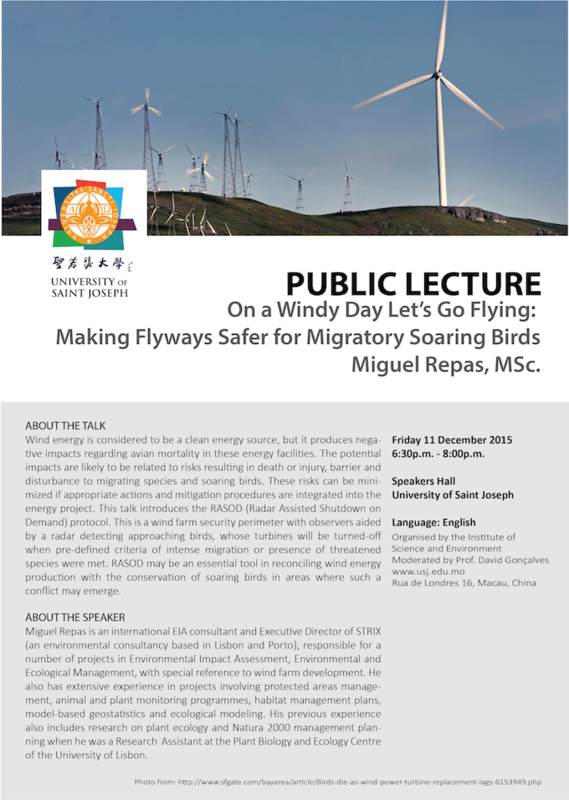 The potential impacts are likely to be related to risks resulting in death or injury, barrier and disturbance effects for migrating species and soaring birds which can affect both their condition and behavior and result in disturbance along the migratory route. These risks can be minimised if appropriate actions and mitigation procedures are integrated into the energy project. BSJ 50MW Wind Farm (SW Portugal) is within a migratory flyway of international importance, being crossed by more than 5000 individual birds of over 30 different soaring bird species every autumn. The wind farm’s licensing was conditioned to the implementation of thorough bird mortality mitigation procedures including temporary curtailment of wind turbines in order to reduce the probability of bird casualties from collisions. Radar Assisted Shutdown on Demand (RASOD) protocol, is a wind farm security perimeter with observers aided by a radar detected soaring birds approaching the wind farm, whose turbines were to be turned-off when pre-defined criteria of intense migration or presence of threatened species were met. RASOD may be an essential tool in reconciling wind energy production with the conservation of soaring birds in areas where such a conflict may emerge. Miguel Repas is an international EIA consultant and Executive Director of STRIX (an environmental consultancy based in Lisbon and Porto), responsible for a number of projects in Environmental Impact Assessment, Environmental and Ecological Management, with special reference to wind farm development. He has also extensive experience in projects involving protected areas management, animal and plant monitoring programmes, habitat management plans, model-based geostatistics and ecological modeling. His previous experience also includes research on plant ecology and Natura 2000 management planning when he was a Research Assistant at the Plant Biology and Ecology Centre of the University of Lisbon. He was also an invited lecturer at the University of Algarve.